On September 15, 2011, news media reported that the Indian Union Home Minister stated that left-wing extremism (Naxalism) is the most violent movement in the country and that the Communist Party of India (CPI Maoist), the primary Naxalite group, is the most violent organization in the country. The Naxalites have a long history of conflict with state and national authorities, including frequent attacks on local police, paramilitary forces, and government officials. Inspired by Chinese communist revolutionary Mao Tse-tung, the insurgents, called Naxals, have been fighting in eastern and central India for decades, demanding more jobs and resources for farmers and the poor, using violent acts including bombings, and hit and run attacks against authorities. India’s Maoist groups have their roots in the peasant movement of Andhra Pradesh following independence, but were later radicalized with the introduction of Maoist ideologies. Several groups merged in 2004 to form India’s Maoist Communist Party, which seeks to overthrow the government and bring about their definition of a classless society. Although that group is banned, India has several other communist parties that are regularly elected to positions in parliament and the legislature. Since the Maoist/Naxal threat was not secessionist, but rather one of law and order the police and state governments, and not the military, bore the responsibility for addressing the challenge. The military could, and is, working on a limited basis with the police in an advisory or training capacity, but they are not involved in active, kinetic operations. However, the military is monitoring the threat to ensure that it does not get out of hand. Disputes over land and natural resources are pervasive in India. The courts are clogged with unsettled land disputes. In the eastern and northeastern states of India, conflicts over forests and agricultural lands have their roots in longstanding inter-communal, ethnic and separatist conflicts. In Scheduled Tribes [ST] areas, disputes related to the illegal alienation of ST land to non-tribal people are common. In several central and northeastern states, large companies have purchased land and mineral rights from state governments, which has contributed to the growth of a well-armed Maoist insurgency known as the Naxalites. In India today there are many Maoist parties and organizations that either predate the Communist Party of India (Marxist-Leninist) or emerged from factions when the CPI-ML split after the death of Charu Majumdar. Three of them, the CPI-ML (People's War), CPI-ML (Party Unity), and the Maoist Communist Center (MCC), are currently engaged in armed struggle. 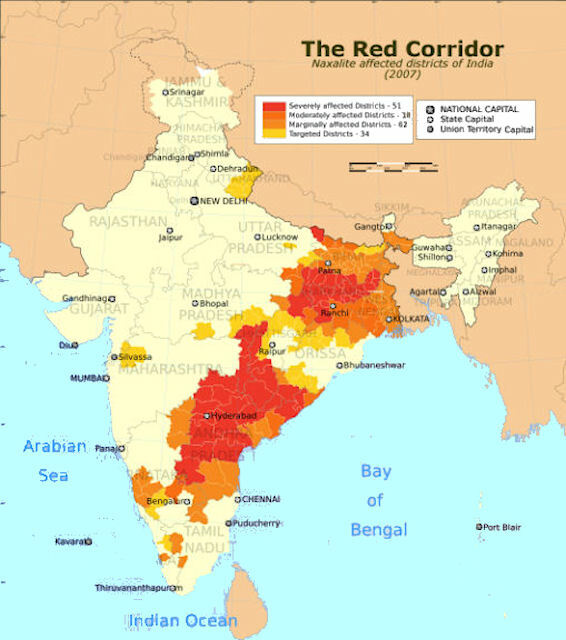 An inter-connected "Naxalite belt" stretches across central India, comprising Bihar, MP, Orissa, AP, Maharashtra and parts of Tamil Nadu. Those parts which were connected to the neighboring states came under the influence of Naxalism. Its members are called Naxalites after the eastern Indian town of Naxalbari, where their movement originated in 1967. The 25 May 1967 peasant uprising at Naxalbari in Darjeeling district of West Bengal began under the leadership of revolutionary communists belonging to the Communist Party of India - Marxist [CPI (M)]. The uprising was brutally suppressed by the CPI (M)-led United Front government of West Bengal at the behest of the Congress government at the Center. In reaction, communist revolutionary ranks rebel against the leadership of the party. The rebellion soon assumes an all India dimension. Entire state units of CPI (M) in Uttar Pradesh and Jammu and Kashmir and considerable sections in Bihar and Andhra Pradesh joined this rebellion. On 22 April 1969 they formed the Communist Party of India (Marxist-Leninist). Since 1980 clashes between police and Naxalite Maoist revolutionaries have taken place in northwestern Andhra Pradesh. In areas under their control, Naxalites dispense summary justice in "people's courts" which in some cases condemn to death suspected police informers, village headmen, and others deemed to be "class enemies" or "caste oppressors." The Naxalites extort money from business firms, and railway services in one area had to be canceled in July and August due to PWG destruction of stations, track and signaling equipment. Over the past few years, hundreds of policemen and suspected Naxalites have been killed, according to press reports and human rights organization. As of September 1998 police had killed 102 Naxalites in approximately 80 "encounters." Decades of guerrilla-style conflict have led to serious human rights abuses by both sides. Human rights groups allege that "encounters" are usually faked by the police to cover up the torture and subsequent murder of Naxalite suspects, sympathizers, or informers. These groups cite as evidence the refusal of police to hand over corpses of suspects killed in "encounters," which are often cremated before families can view the bodies. Andhra police have contributed to the establishment of an armed vigilante group known as the "Green Tigers," whose mission is to combat Naxalite groups in the state. The NHRC is investigating some 285 reported cases so-called "fake encounter deaths" allegedly committed by the Andhra police in connection with anti-Naxalite operations. Between 1999 and 2001, several hundred deaths a year were attributed to Naxalite/ government fighting and activities. The revolutionaries sought to carve out a "Compact Revolutionary Zone"; however their efforts were suppressed by the Indian and Nepalese governments. In February, 2002 the Home Ministry held several rounds of talks with the state government of Andhra Pradesh and a representative of the Peoples War Group. In June 2002, the group withdrew from those talks following a police encounter. By May of 2003, tensions seemed to ease. The Naxalite revolutionaries had not been violently active in the preceding 4 months, and the Indian Government appeared committed to implementing the 1997 act which stipulated improvement for the Naxalite population. The government decided to reduce the number of police forces in the area, and agreed to unconditional talks with the revolutionaries. An assassination attempt against Chief Minster Naidu of Andhra Pradesh marked a serious downturn in the peace process and PWG and the police to step up their activities. In 2004 a government three month long cease-fire and a temporary lifting of a ban of the PWG failed to result in a long term peace agreement. More than 500 people were killed in 2004 in sporadic low-intensity conflict. 2004 also marked an important political development in the Naxalite movement. During the final months of 2004 the PWG merged with the Maoist Communist Center of India, creating the Communist Party of India (Maoist), becomming the largest Maoist rebel group with operations in over 9 states. This group also stepped up cross border relations with Nepal's Maoists. In the wake of the breakdown of the peace process between the PWG and the Andhra Pradesh state government in 2004, the fighting between government and Naxalite forces increased in 2005. While the fighting remained low-intensity and sporadic in nature, over 700 people were killed, a third of whom were civilians. In 2005 the Chhattisgarh state government enacted the Special Public Security Act (SPSA), which permits detention for as long as three years for loosely defined unlawful activities. Human rights groups voiced concerns that the law criminalizes any support given to Naxalites (Maoists), even support provided under duress. In July, 2006 violence between Naxalites and government forces increased significantly. On July 17, an armed group of approximately 800 Naxalites attacked a relief camp in Dantewada killing at least 25 people and wounding 80 more. It is believed that the Naxalites staged their attack from the Andhra Pradesh state. The relief camp targeted provided shelter to over four thousand internally displaced persons. Four Naxalites were reportedly killed in retaliatory fire. On July 23, 2006 in what was claimed as a major blow against Andhra Pradesh Naxalite forces, the Naxalite leader of the Andhra Pradesh state was killed in a raid along with seven other people by police in the Prakasam district. From 2002-2006 over three thousand people had been killed in Naxalite-goverment conflicts. In central and eastern India, armed conflicts between Naxalite (Maoist) insurgents and government security forces over land and mineral resources in tribal forest areas continued, affecting 182 of the country’s 626 districts in 20 of its 28 states. Most of the conflict areas overlap with the Dandakaranya forest, which covers parts of West Bengal, Jharkhand, Orissa, Chhattisgarh, Andhra Pradesh, and Maharashtra. The forest also has large deposits of mineral resources, such as bauxite, iron ore, and uranium, and is home to millions of tribal persons. The Ministry of Rural Development in 2009 estimated that up to 400,000 persons had been displaced since the conflict began. During the year “Operation Green Hunt,” the government’s initiative against Naxalites in Chhattisgarh, Jharkhand, Orissa, and West Bengal, continued. Human rights advocates argued that the operation sought not only to suppress the Naxalites but also to force these tribal persons off their land, allowing for commercial development. In central India, armed conflict over land and mineral resources in tribal forest areas continued into 2010. Fighting between Naxalite (or Maoist) insurgents and government security forces supported by Salwa Judum militia and Special Police Officers affected more than 200 of India’s 626 districts in 20 of its 29 states in mid-2010. By March 2009, the conflict had displaced 350,000 members of tribal groups, and over 100,000 were believed to have been displaced between mid-2009 and mid-2010. IDP camps that opened in Chhattisgarh for displaced tribal persons caught in fighting between Naxalites and the Salwa Judum in 2006 continued to operate. On 05 July 2011, the Supreme Court pronounced the state-sponsored militia Salwa Judum “illegal and unconstitutional” and directed the government of Chhattisgarh to disband the operation. In addition the court asked Chhattisgarh to immediately cease and desist from using as SPOs tribal persons who had been chosen from Salwa Judum camps against Naxalites in the state, and to recall all firearms issued to SPOs. The Chhattisgarh government was ordered to stop issuing funds in support of SPO recruitment. Following the July 5 judgment, the Chhattisgarh government claimed to have disbanded the Salwa Judum. By September approximately 50,000 tribal persons displaced by the Salwa Judum had returned to their villages. Approximately 15,000 tribal persons remained in 15 Salwa Judum camps. During 2011 India’s armed forces, individual states’ security forces, and paramilitary forces continued to engage in armed conflict with insurgent groups in Jammu and Kashmir, several northeastern states, and the Naxalite belt in the central and eastern parts of the country. There was considerably less violence in Jammu and Kashmir than in previous years. Although army and central and state paramilitary forces remained deployed in some states of the northeast and in West Bengal’s Naxalite belt, by year’s end most of the northeast insurgent groups were involved in peace negotiations with the central government. In Naxalite (Maoist) affected districts, there were reports of excessive use of force by security agencies. For example, in the Dantewada district of Chhattisgarh, Koya Commandos, an armed wing of ‘tribals”--an indigenous group operating with the state government’s approval as SPOs--and CRPF personnel attacked three villages between March 11 and March 16 in search of Maoists. Civil society activists reported that three tribal members were killed and three women were sexually assaulted. The security forces also burned approximately 300 tribal homes. Initially the Chhattisgarh government refused to order a probe into the incident and transferred a top government official in Dantewada who tried to send relief material to the villagers. Human rights activist Swami Agnivesh and journalists who attempted to visit the villages were attacked by SPOs. After severe criticism in the media and a protest by human rights activists, the government responded by transferring a police officer involved in the attack on Agnivesh and ordered a judicial probe. On July 5, unsatisfied by the judicial probe and affidavits filed by the Chhattisgarh government, the Supreme Court ordered the CBI to probe the incident. The CBI did not complete the probe by the end of 2011. Naxalites abducted individuals during 2011. For example, on February 16, a group of 50 Naxals in Orissa kidnapped Indian Administrative Services officer RV Krishna and junior engineer Pabitra Majhi. They were released on February 24, after the Orissa government accepted the Naxalites’ demands. There was no evidence that insurgent forces made attempts to prevent or punish human rights violations by their members. There were no reports of deliberate attacks on government hospitals, primary health centers, workers, ambulances, or patients, nor were there restrictions on accessing medical facilities in the Naxal areas of Chattisgarh and Maharashtra. However, there were recorded attacks and explosions at schools, roads and railways tracks. There were no attacks on medical services or Below Poverty Line ration shops. In Chhattisgarh Maoists continued to attack security forces and civilians, killing 13 CRPF personnel in Dantewada District on June 10 and 12. On 19 August 2011, Maoists killed 11 policemen and one civilian in Bijapur District. In Assam there were six incidents during the year of bomb explosions, although no deaths were reported. One explosion, in Kamrup (Rural) District, engineered by the Adivasi People’s Army, injured 100 persons. On 07 January 2011, in Netai Village, part of West Bengal’s Maoist-dominated West Midnapore District, nine persons died when armed Communist Party of India (Marxist) (CPI-M) workers fired at 2,000 villagers gathering around the house of a CPI-M party leader. This was the bloodiest incident in West Bengal since March 2007, when police killed 14 villagers in Nandigram. The CBI investigated and charged several local and district CPI-M leaders. In response to allegations of Maoist involvement in the incident, the Maoist-backed People’s Committee Against Police Atrocities spokesman argued that the villagers organized themselves to destroy the “harmad” (armed goons) camps, something the administration failed to do. The South Asian Terrorism Portal (SATP), run by the nonprofit Institute for Conflict Management, database reported that during the year 2011 at least 480 persons--including 182 militants, 99 security force personnel, and 199 civilians--were killed as a result of Naxalite (Maoist) violence, a decrease from 2010, when 212 militants, 250 security force personnel, and 528 civilians were killed. According to the SATP database, in 2012 total terrorism or insurgency related fatalities continued to decrease from the previous year. The total deaths reported declined from 1,073 in 2011 to 804 in 2012 (252 civilians, 139 security personnel, and 413 militants). The SATP database reported that 368 persons--including 118 militants, 104 security force personnel, and 146 civilians--were killed during the year as a result of Naxalite (Maoist) violence, a decrease from 2011, when 199 militants, 128 security force personnel, and 275 civilians were killed. The Institute for Conflict Management reported that there were 117 fatalities in Jammu and Kashmir during the year, including 84 alleged terrorists, 17 members of the security forces, and 16 civilians. During the year 2013 the SATP reported 589 fatalities due to terrorism and insurgency (other than Maoist extremism), including 297 civilians, 192 security force members, and 390 terrorists. According to the SATP fatalities due to terrorist violence in the Northeastern States decreased from 316 deaths in 2012 to 271. Fatalities from terrorist violence in Jammu and Kashmir, however, increased from 117 deaths in 2012 to 181 as of December 29. The SATP database reported that 419 persons, including 110 security force personnel, 158 civilians, and 151 Maoist militants, were killed during the year as a result of Naxalite (Maoist) violence, an increase from 2012 when 104 security force personnel, 146 civilians, and 117 Maoist insurgents were killed. The Institute for Conflict Management reported 181 fatalities in Jammu and Kashmir during the year, including 61 security forces persons, 20 civilians, and 100 terrorists. In Naxalite (Maoist) affected districts, there were reports of excessive use of force by security agencies and insurgents. For example, on July 7, Maharashtra police killed six suspected Naxal women in Mendhari village, in Gadchiroli District. After a fact-finding mission, the human rights NGO Coordination of Democratic Rights Organization filed a complaint alleging that police killed the women in captivity after they asked to surrender. Police denied the allegation, and the government of Maharashtra ordered a judicial inquiry. The Indian government vowed in January 2015 to unleash a massive offensive against Maoist rebels in five central and eastern Indian states, which had been most hit by the Maoist insurgency. But there were voices of caution from civil society that an armed confrontation could further hurt the marginalised and largely indigenous populations in the worst-affected states. In July 2016 the insurgents killed 10 paramilitary soldiers in an ambush in eastern Bihar state. Eight of the officers were killed instantly when the rebels detonated several homemade explosives. A few months later Indian police forces tracked down and killed 24 Maoist rebels in a midnight gunfight in Odisha, the most casualties the group suffered that year. On 02 February 2017, authorities reported that Maoist rebels in eastern India are suspected in the deaths of at least eight police officers killed in a landmine blast. According to senior police officer K.B. Singh, another five officers sustained injuries after their vehicle was attacked in the Koraput region. Police sources said that four bodies were recovered at the scene, while four others died later at a hospital. The 13-man team of young recruits were on their way to Cuttack to be trained as police drivers.